Dec 31, 2017-Four days after emerging victorious in the House of Representative elections from Kathmandu-4, Gagan Thapa left for South Africa to attend a meeting of the Lancet Commission on High Quality Health Systems on December 12. The focus of the meeting was health system quality in low- and middle-income countries and attended by veterans of the field. Thapa says that at the meeting in South Africa, he strongly brought up issues regarding medical education and how it is directly linked to the quality of the health care system. “It is these people who will ultimately go to the field to serve the people. And if the input is wrong, we can’t expect the output to be correct,” he says. Thapa recently returned back from the meeting and spares few hours each week to discuss with his fellow authors via Skype and email. At a time when the country’s political actors are not shy of sounding off overpromises and improbable dreams, leaders like Thapa are showing how politicians can actively formulate science-backed and data-driven policies. “I am constantly in touch with academics. I always seek their suggestions and this helps me make informed decision,” he says. As a result, Thapa still remains popular as one of the most high-performing ministers to have assumed office in the past decade. Thapa took over as the Health Minister on August 27, 2016 and at the time he did not have prior experience in any ministerial positions. As part of the Cabinet led by Pushpa Kamal Dahal, who was determined to prove his second inning a success after a disastrous stint in office in 2008, Thapa found a perfect platform to showcase what changes good leadership can bring. At the time, all eyes were on Thapa who has remained a popular political figure since his days as a youth leader. The ever-eloquent Thapa had served as chairperson of the Agriculture and Water Resource Committee and was hailed for issuing stringent directives to the government when in office. As a popular leader of the masses, Thapa had also spoken vehemently against the lackluster workings of the government and he was thrust into the public eye once he took charge of the Health Ministry—a ministry long-considered fraught with irregularities. In his nine months in office, thereafter, Thapa proved himself to be an efficient and a visionary leader whose impact is still reverberating in the country’s health system. But what is more important, Thapa has been constantly following up on the tasks that were left midway during his brief tenure. His strong commitment towards building a sound health system was apparent when he met his two health ministers who assumed office after him, informing them of his past initiatives and presented them meticulously documented reports on the work that lay ahead. The first task that Thapa undertook was to streamline the health rights enshrined in the newly-promulgated constitution. “We don’t have the luxury to now say that rights guaranteed by the Constitution are too expensive to deliver. Instead, we should find ways to provide it. This is where my role evolved from a politician to an efficient manager,” said Thapa at the time. He then reviewed free health care services offered by the government in order to look into budgets so that the programmes could run efficiently. Immediately, Thapa also began formulating guidelines on curbing the state-sponsored foreign healthcare visits by former politicians and bureaucrats. This guideline to halt the arbitrary distribution of money was later approved by the parliament. During his tenure, Thapa also focused heavily on policy reforms. Around 20 policies, acts and regulations were either formulated, drafted or amended during his nine months in office. That includes the Health Insurance Act which aims to bring all citizens on board the government’s social health insurance programme. The Hospital Pharmacy Regulations was another of his key reforms. It mandates each government hospital to establish its own pharmacy. These pharmacies, now established in over 60 hospitals, provide drugs at almost half the market price. Another major work that is yet to see the light of the day is the ‘Quality Assurance and Accreditation Authority’ whose primary task will be to monitor, evaluate and certify the entire health services offered by health institutes. It will also ask concerned authorities to book the guilty after investigating any negligence on part of healthcare providers. Thapa had also worked hard to table the Social Health Insurance Bill in the parliament, before it stalled in the legislature due to a few contentions. For this his team prepared a list of amendments, however, his tenure as health minister ended before that could transpire. He later himself filed these amendments, including provisions that made the insurance mandatory and the premiums based on income levels. All of these important provisions were included when it was endorsed by the Cabinet on October 10. Recently, another task of Thapa’s initiative materialised. Given the rising cost of drugs, Thapa had formed a committee to review the drug prices and suggest ways to reduce the cost as much as possible. A report developed by Thapa’s team revealed that private companies and wholesalers sell some drugs with profit margins that ranged from 400 to 2,200 percent. directly from international companies to sell them at cheaper rates from hospital pharmacies. The high-level committee on providing cheap and quality drugs was led by Binod KC, secretary at the Public Procurement Monitoring Office. Similarly, Ministry of Health is still working in developing Janata Swasthya Clinic, a model health facility that could function effectively in promoting healthy habits and provide few basic treatments. 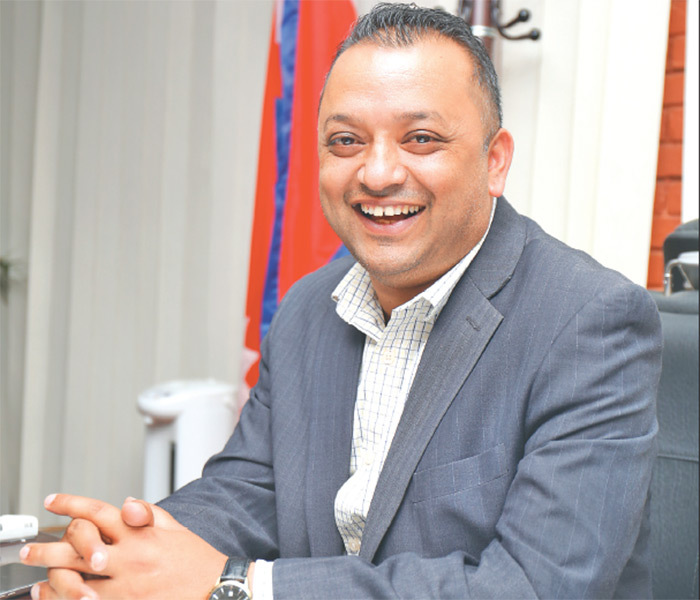 One of the major successes that Thapa claims is that he has been able to make health a political agenda within his party and has set precedence for other parties as well. “Health, although being a major political agenda, is often times overlooked and mostly limited to hospital care. But health is more than that,” he says. Thapa’s tenure, however, had its share of critics. A major criticism that Thapa still faces is that he bypassed the bureaucratic system and failed to work with officials at the MoH. Also, there are other who also criticise Thapa for enrolling his party cadres in a majority of the hospital committees and in administrative position of hospitals. Thapa takes all these allegations seriously yet expresses his determination to correct them if given the chance. “It is the ‘doers’ who make mistakes and learn from it. I still think that our health system needs a major overhaul. I have a vision for this change and if it is implemented earnestly that could pave the way for a model healthcare system in the country,” he says.